Douglas Fogel, Psy.D has been in full-time clinical practice for over ten years. He worked for 10 years at Johns Hopkins University (JHU) as a counseling center clinician, supervisor of predoctoral interns, and an adjunct professor for the JHU Psychology Department. More recently, Dr. Fogel has been working in private practice and is a teacher/supervisor for practicum students in the Clinical Psychology doctoral program at Loyola University. Dr. Fogel is finishing his first book titled Why Psychotherapy Works (And How to Do It). An overarching focus of the book is on establishing greater emotional integration with the goal of increasing behavioral flexibility and willingness. Successfully doing this allows clients to take their lives in a more values-oriented direction (such as increasing intimacy with those closest to them). 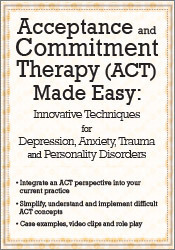 Dr. Fogel has presented a number of training seminars on Acceptance and Commitment Therapy (ACT) to centers in the Baltimore/D.C area and his upcoming book is strongly informed by an ACT perspective.